Hi, the Bella & Friends stamp set is totally adorable. I’ve already made a couple of cards using this set (you can see them here). There are still so many cute images in this set waiting to be used. 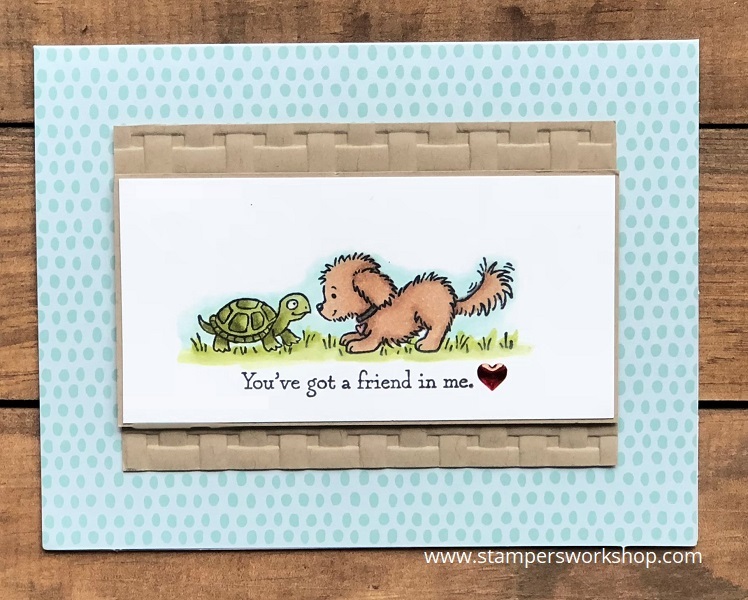 As well as the sweet stamps of Bella and her friends, there are also some lovely sentiments which could be used for many occasions. I love a stamp set which offers multiple possibilities within it. For today’s card, I stamped the image and the sentiment with Memento Tuxedo Black and coloured with my Stampin’ Blends. I matted the panel with some Crumb Cake cardstock. My plan was to place this panel directly on to the Tutti-Frutti card base but I felt it was a little too plain. I had some off-cuts of Crumb Cake which I had run through the new Basket Weave Dynamic Textured Embossing Folder (now available as an item you could earn for free during Sale-A-Bration). I thought these pieces would be a nice touch and wouldn’t overwhelm the small centre panel. The last touch was to add a coat of Wink of Stella to Bella and her friend. I also used my Cherry Cobbler Stampin’ Blends to colour a silver heart from the Metallic Enamel Shapes pack as I wanted a lovely red heart to add a punch of colour. Isn’t this darling! I LOVE colouring these images. I coloured Bella very simply but you could easily use different colours and styles (such as patches) to really personalise Bella for your recipient.